Manager Derek Adams thinks Ross County are the healthiest performers of the five relegation play-off contenders in the Scottish Premiership. County are one of three teams on 34 points, one above second-bottom Kilmarnock and one below St Mirren. "We are the form team in the bottom six in 2014," said Adams ahead of Saturday's trip to St Mirren Park. ""We have taken 23 points and done really well, and we want to take that momentum into the last three games." 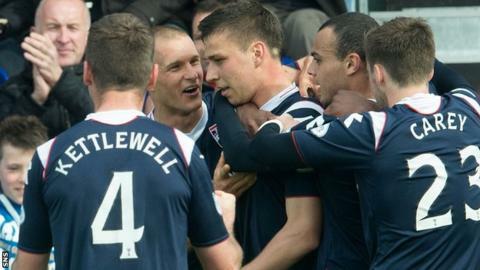 The Dingwall side's form has improved in the second half of the season, with County having struggled at the start of the campaign. "We have got match-winners and you need that going into the last few games," explained Adams. "We've got players that score goals; Melvin de Leeuw has eight, Filip Kiss has six Richie Brittain has six. "And we have players with good individual talent like Graham Carey and our defenders have done well as well." After the Staggies visit the Buddies they have a midweek home game against Hibernian before finishing away to Partick Thistle on 10 May. And Adams hopes those fixtures will garner enough points to avoid a two-legged match-up with a top Championship side. "We want nine points and we've shown that we are capable of that," he added. "It's a big week for everyone in the bottom six and we want to finish top of the pile." Adams was busy in the January transfer market, bringing in a host of new faces, including Yoann Arquin and loan players Erik Cikos and loan signings Kiss, Yann Songo'o, Michael Tidser and Jordan Slew. And all of those players have made an impact as County aim to extend their stay in the top flight to three seasons. Blackburn forward Slew is yet to score but the manager has been has been pleased with the forward's contribution. "Jordan Slew has been an excellent signing for us," said Adams. "He's taken the ball in, he's been strong and created openings for others. "I would think all of them would go back to their parent clubs. What they want to do here is get game time and we've been able to provide that. "They've all done well for us and I want them to finish on a high in these last three games."